Introducing the star of the October Kiwi Book Club …. Little Hector! From award-winning picture book creator Ruth Paul comes a new series about a plucky little dolphin called Little Hector and his big adventures. 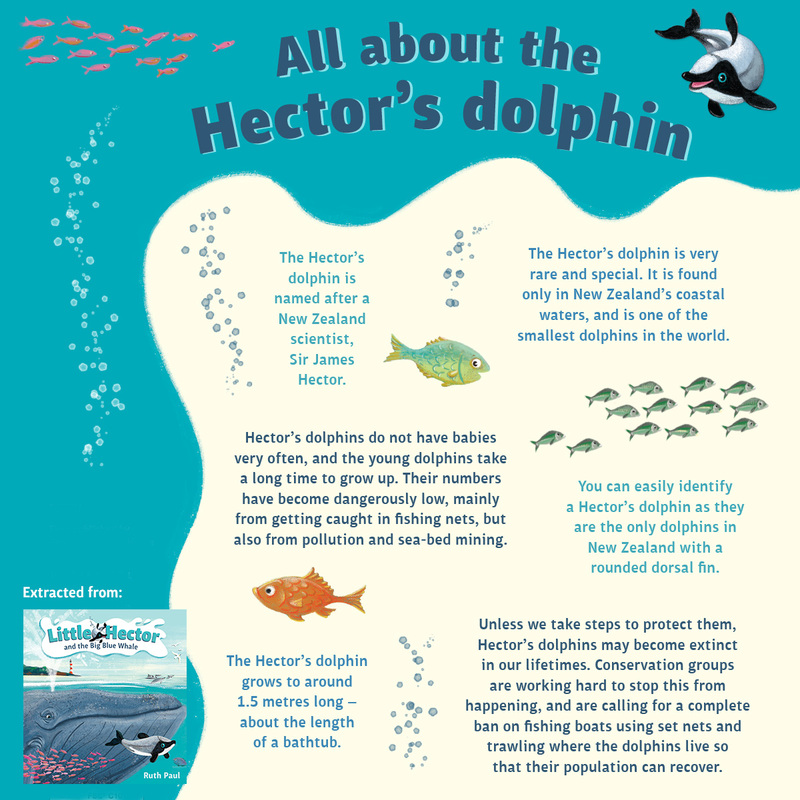 Little Hector is a small but daring dolphin, who swims out into the deep blue ocean. He meets many dangers — and an unlikely friend — and proves you are never too small to have BIG adventures. Children will love meeting Little Hector and his friends, and will also learn how we can help to look after our precious marine environment and its inhabitants. Ruth Paul lives in an off-grid, straw-bale house on a farm just outside Wellington, New Zealand. As well as writing and illustrating children’s picture books, Ruth has worked as a costume illustrator for Peter Jackson movies. She has two teenage sons and is actively involved in her local community, having previously chaired her local Community Board and School Board of Trustees. Over the years, Ruth achieved a Bachelor of Arts majoring in English and History from Victoria University, a Diploma in Visual Communication Design from Wellington Polytech (now Massey University), and most of a law degree. Ruth’s books have sold in New Zealand, Australia, USA, Canada, the UK, China and Korea, with translations in five languages. Her original picture book illustrations have contributed to touring exhibitions for Painted Stories (previously Te Tai Tamariki Trust) and two are held in the prestigious Mazza Collection at the University of Findlay, Ohio. Thanks to Penguin Books NZ and Ruth Paul Picture Books we have some fun facts and a Little Hector Maze for everyone to enjoy! Join The Kiwi Book Club! Watch with glittering eyes the whole world around you, because the greatest secrets are always hidden in the most unlikely places. Those who don’t who don’t believe in magic will never find it.